Please note that by clicking on a link you may be directed to a third party’s site. You should respect the intellectual property on that site. A new home, a new language, a new family and a new career – these are just some of the challenges that Anica was able to meet with the support of her Disability Liaison Officer and deafConnectEd. Anica was born overseas and moved to Australia to start a new life and a family with her Australian partner. Already fluent in her native sign language, Anica took to Auslan (Australian Sign Language) quickly and enrolled in a Cert III in Aged Care. Although Anica’s studies were going really well, her progress faltered and the DLO contacted deafConnectEd concerned that she may withdraw. 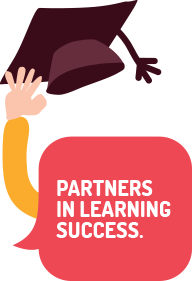 deafConnectEd was able to bring all the parties together to clarify course requirements, expectations and Anica’s changed support needs, helping her to get back on track and ultimately to graduate. As the case study above demonstrates, we understand the complex challenges faced by disability support staff. We are funded to provide you with the support you need to meet those challenges. Telephone advice. If you have any questions, you can simply call us. Our staff have a wealth of experience on issues relating to deafness and hearing loss. We can therefore offer practical suggestions for reasonable adjustment in the classroom and information about support services such as Auslan interpreters and notetakers. The Central Auslan Booking Service (www.cabs.org.au). If you have a student who is deaf and needs an Auslan (Australian Sign Language) interpreter, we can help you to advertise your interpreter booking needs to our pool of accredited interpreters to help you fill those bookings as quickly as possible. Professional development programs for teachers, student support staff and administrators. Deafness and hearing loss are not always well understood and having an Auslan interpreter in the classroom for the first time can seem a challenge. Our short, tailored information sessions therefore provide staff with the opportunity to ask questions, clarify expectations and develop practical skills for an inclusive classroom. Short sessions are delivered at no cost to the training provider. Notetaker training. In 2014 we are piloting an introductory online course for notetakers with the aim of expanding on this in subsequent years. DLOs can contact deafConnectEd to organise access for their support staff. There are also resources for interpreters and notetakers which can be found in the relevant section of our site and the Resources section.